Your cart is empty. Add items at order details. Stone, Steel, Millwork, MEP, HVAC. Order all your sbmitals on Idrawpro with ease! Start with free quote now! 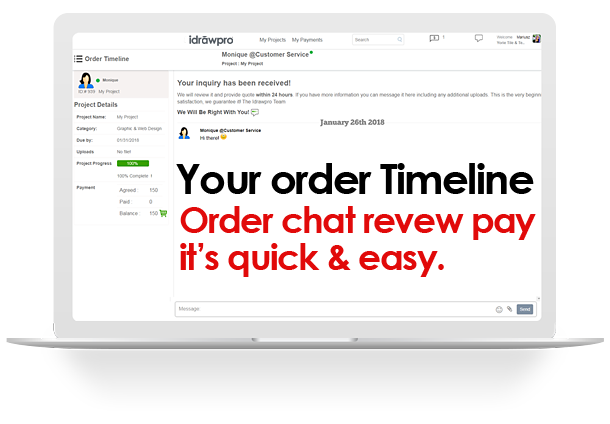 Easy online ordering with live agents! Use your desktop to track progress, communicate and share, and much more. Always know what's going on with your project, what is getting done and what still needs doing. Use your mobile device for easy messaging on-the-go. You can always stay in touch with us when you have questions, updates or need to share. Use our free image/pdf editor to add comments to your order then send the file to us with just one click. "We need shop drawings for 2 1/2" bluestone panels including the anchorage engineering and cut tickets"
State-of-the-art security, all transactions are secured with 2048-bit Extended Validated SSL encryption and $1,750,000 warranty. Our safe Escrow Milestone Payment system ensures your payments are released only when you are satisfied. Our representatives are available 24/7 to assist if you have any problems. There is no commitment or cost to post a project. Best place to order shop drawings & drafting services online.